A fantastic Athletics Carnival at the AIS! For all enrolment inquiries please follow our Future Students link. 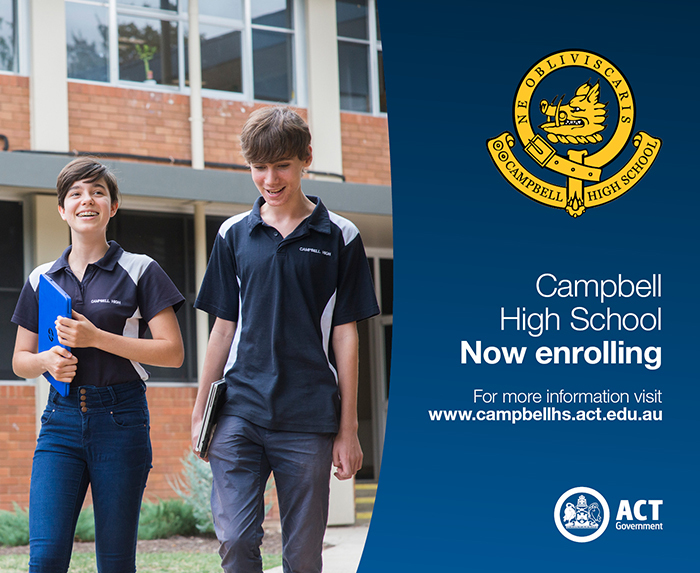 Campbell High Information Night for Year 7, 2020 - Tuesday 14th May 2019 - (6:00pm - 7:30pm). At Campbell High School, we focus on improving literacy to improve student communication in all its many forms. The Literacy Handbook has been created to assist and support ALL students to achieve the best possible results when completing classwork and homework. The BSSS handbook "What's plagiarism? How you can avoid it" contains comprehensive information including examples on Harvard bibliographies and in-text citations. This will assist students in the creation of essays, scientific reports and articles. The following advice has been received from QCity Transit regarding the school bus service for students residing in Bungendore. Commencing the first day of Term 1, 2019, school services S169 & S174 from Bungendore to Campbell High School in the morning will be combined as school service S174. In the afternoons, school services S182 & S188 from Campbell High School to Bungendore will be combined as school service S188. These combined service routes have been prepared to ensure that they pick-up and drop-off at all locations that were previously serviced. If you have any further questions about these amendments to services in the Bungendore area, please contact QCity Transit School Services Coordinator on 6299 3722 for more information. 2019 Book packs for each year group are now available - please follow the appropriate link below. Note that orders placed through OfficeMax on or before 2nd December 2018 will be delivered free of charge before the end of December 2018. Other delivery details are available in the on-line book pack instructions. The Year 10 Leadership Biographies includes a short self-introduction and photo for all students in the Year 10 Leadership Group. These students are there to support and be the voice for the entire student body. Please remember these faces and encourage your children to seek them out at any time should they need help or just a friendly face in the school. The Minister for Education and Early Childhood Development, Yvette Berry, recently announced details of the ACT Government’s commitment to allocate secondary students with portable computing devices for learning under the "Better Schools For Our Kids – Technology Enabled Learning Initiative". Please visit our BYOD page for more information about how this will be rolled out at Campbell High School. Campbell High School “Support for Students: A Guide for Parents & Carers” has been updated with the relevant information for 2019. The resources available on the Student Wellbeing Hub help to create learning communities that promote student wellbeing and the development of respectful relationships. The Hub is guided by the principles of the National Safe Schools Framework, which highlight the importance of educators, parents and students working together. School psychologists (SPs) provide a psychological service to enhance student learning, engagement and wellbeing. The following letter provides information about the role of the school psychologist and available support options for students. If you have any general concerns about the wellbeing or educational progress of your child, the first point of contact should be the relevant contact teacher then the year coordinator. Campbell High's Homework Wheel - how to maximise your child's learning at home. Sometimes your child may not have homework, in fact research suggests that traditional homework is not a productive learning tool for young people in the 21st century. We have created this simple framework to assist you in developing your child's whole self through a never ending process (the wheel). The wheel considers 21st learning skills [communication, collaboration, critical thinking and creativity] to optimise their big picture learning. If your child suggests they have no homework, please refer to the Homework Wheel to guide further conversation. Any feedback you may have on our Homework Wheel is appreciated. Here is the Campbell High School's Text Type Book that you can use when completing assignments and homework. Before you write and submit your 'good copy' make sure you have used correct text type format and edited your work. Use this booklet as a reference so that you can produce work that is at your best. If you have any questions or need assistance in using this Text Type Book please contact your classroom teacher. The ACT Education Directorate's Policy for Insurance and Ambulance Cover can be found on our Policies and Guidelines page. Our school uniform is important to us. Our uniform policy is endorsed by the School Board, supported by the P&C and is something we work to uphold. The wearing of uniform unites our student community as a whole group. This is the link to our uniform page. This link is for Campbell Staff only. It allows access to the absences application. This is the link to our Absences Application.